The night had put his boots on. He strode purposefully through the sky, tearing at clouds with raw knuckled fists. I made my way through the mud, it sieved through my toes and crept in splatters, creating a dot to dot of earth on my shins before it trickled back down in tadpoles, leaving a web of dirt on my skin. 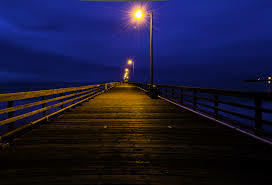 He was waiting there, at the end of the pier. The wood splintered beneath my feet, catching the soles of my sandals which creaked a warning to him as I approached. He stayed, motionless with his back to me until I reached his side. I remembered the day I had arrived here, all khaki shorts and sunburnt skin. The city has seemed so different then, tense with promise. High rise buildings, beetle black, stretched like dominos along the coastline. The lights from every shop, bar and club had merged into a delicious kaleidoscope of colour. It was the end of the rainbow. My chest of gold. The club had been catastrophically hot. The air thick and wet as it pressed down on my chest, I sucked on a cigarette and slumped against the bar. I had pulled up my T-shirt hoping for relief, but only exposed a damp bellybutton to damper air. ‘Another shot?’ a heavy wet fist landed on my shoulder buckling my knees. ‘Woah there’ he laughed and pulled me from the elbows. I turned, he had a face like a huge red tomato, plasticine features, and a disco grin. I shook my head. He shook his back, disappointed. ‘Not the girl I thought you were’ he megaphoned into my ear and dragged me to the dance floor. That was the night I’d first heard about him. An urban legend in these parts. The ‘night fisherman’ they’d told me. It was always a friend of a friend, a brother’s cousin’s uncle that someone had slurred up as evidence of his existence. ‘You catch a fish and see your soul’. That’s what they told me. It was a 3 am story, half drunk bottles had stood stacked up by the radiator, volcanoes of ash splurged from coloured glass bowls onto the carpets, and us, slumped like mannequins all around. I had laughed and not believed and leant my head on a cushion embroidered with elephants in tangerine silk that smelt of smoke and sadness. But it had stayed with me, when I awoke the next day, scratchy mouthed, a face full of carpet, the night fisherman kept appearing, a beckoning silhouette in my mind. And I’d finally found him and here I was.. The water creased, scrunched up cellophane on black. I glanced at him sideways. His face was barely visible under a thick duffel hood, wisps of a beard pocked out from two fat rims of chin. He nodded and I tightened my grip. It had been a notice that led me to him. Faded yellow like grease proof paper, edges curled like a fortune telling fish. I don’t know why I noticed it. But there it was in the shop window. I had stopped in my tracks, a kid with pink hair on roller blades and swerved past; turned to give me the v’s and shouted something I didn’t understand. I’d gone into the shop, trying to find out more as I leafed through my translation book for the right words. The shopkeeper had shaken his head and grinned a big clown grin reserved only for foreigners, and had offered me cheap cigarettes and vodka. The net rose, stringy diamonds strained and glistened, saturated by the water. It was heavy. He did not help -the fisherman -but stayed, head turned towards the ocean, scanning the water for shadows of the secrets only he knew. I pulled harder, a flash of silver burst the surface, it was protesting, struggling to escape back down to its murky roots. It did not want to be separated; it did not want to be seen. I hadn’t told anyone I was going. I don’t know why. Perhaps a fear they wouldn’t believe me. Perhaps a fear that they would. It felt like something that should be a lonely task, if it were true at all. The fish landed on the wood with a smack, oily skin on mud. It was huge and bruised with frantic gooseberry eyes. We looked at each other and I saw. The fisherman slipped out of his coat and dove into the ocean, he did not rise again. And the night looked down, kicking at cans with a roar of thunder as me and my soul lay flat-bellied on the bank, the both of us gasping for air.